In today’s web standards, it’s virtually impossible to develop a website without having to make it compatible with all available devices in the market. Therefore, in order to stay relevant in today’s web market, we would need to create a highly robust web design that focuses on a fully responsive framework, and with Metronic, we’ve done just that. 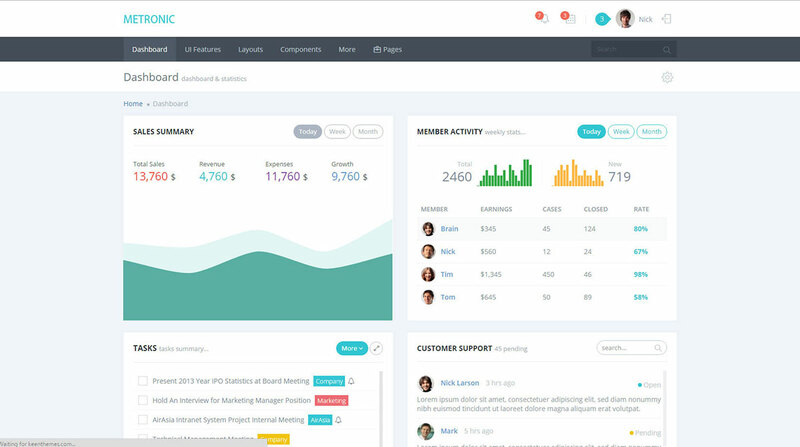 As developers of Metronic, we firmly believe in developing and providing a solid and positive user experience for Admin Dashboards in a form of a HTML 5 template that is easily integrated, customized and deployed. 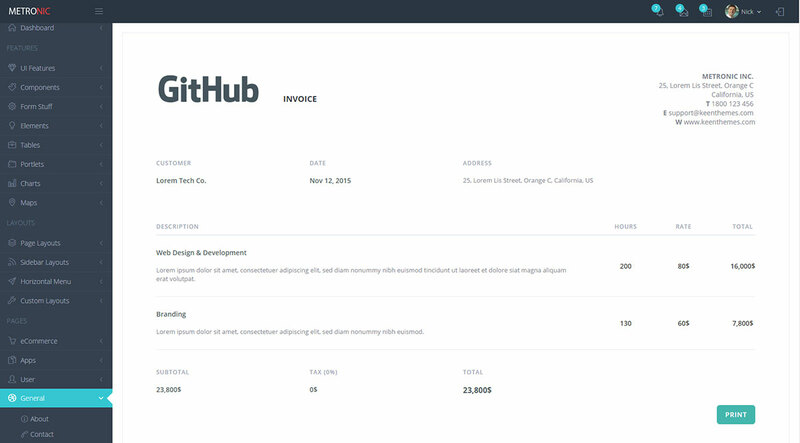 We’ve received over 35,000 satisfied customers and some of which have saved over thousands of hours and thousands of dollars in development time and cost. 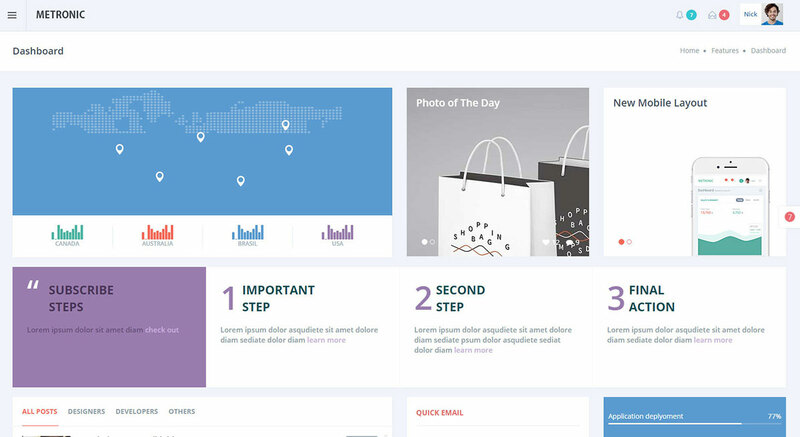 With the integration of Twitter Bootstrap as one of Metronic’s core framework, we are able to provide a robust, fluid grid framework with flexible fonts, images and lay-out. This in overall will maintain our goal to remain relevant in today’s mobile first standards. Screen responsiveness is the key to a success of any web-based system because of the exponential growth of mobile devices easily obtainable by anyone. When there’s a large majority of available technology that allows everyone to browse the web from their device, the need for mobile responsive frameworks is crucial to provide a highly positive user experience. Whilst Metronic is specifically designed for Backend users such as developers or administrators, we are adamant to still deliver the best Interfaces and Experiences for our target audience. Regardless of user types, having a logical, simple and clean interface design will definitely benefit in productivity and efficiency for our end users. In general, a user interface is the layout design on screen which the user interacts with to control the input, settings and / or content for the devices, website or software. Metronic focuses on synergizing the Graphical User Interface (GUI) and a Form Based interface to produce the best possible control for our users to interact with their backend systems. We also focus on delivering multiple design concepts for our User Interfaces in order to cater to a variety of projects that we support. Our design concepts can range from Flat UI design, Material Design to Responsive Designs. Having multiple design concepts will ensure that we commit to our goals to provide the best possible User Experience for all our customers. User Experience (UX) is the overall experience a user faces whilst interacting with the system or application in terms of how easy or pleasing it is to use. Therefore having a great UX will ensure that our customers will be able to maneuver through Metronic’s GUI and Form interfaces with ease. This will in turn increase productivity, efficiency and lower development and maintenance cost whilst utilizing Metronic. We also are aware that there are many available 3rd party plugins available and being used by our customers on a regular basis, that is why when we integrate these plugins we ensure our users that our standards for UI and UX gets translated into these plugins. 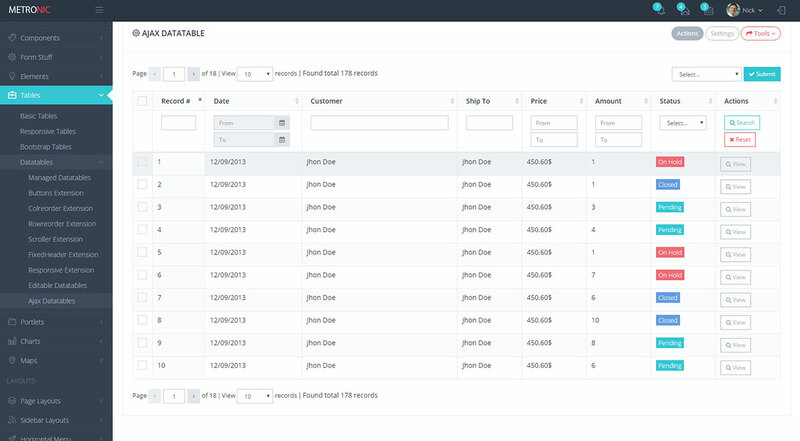 For example, we’ve heavily customized the jQuery Datatables and Bootstrap’s Dropdown menus to increase usability and efficiency. It has to be Clear and Concise in design to ensure that the use does not get confused with the menus, links or any other element within the design. The interface flow and design elements have to be Familiar with general ongoing standards available. It has to have a Consistent Design from an element to another in order for our users to recognize certain relatable elements quicker. As developers ourselves, we’ve had our fair share of stress and frustration going through some badly designed User Interfaces from our past projects. Therefore through countless weeks of research and hardwork, we’ve set a goal to deliver a product to accessible to everyone in order to eliminate these frustrations. 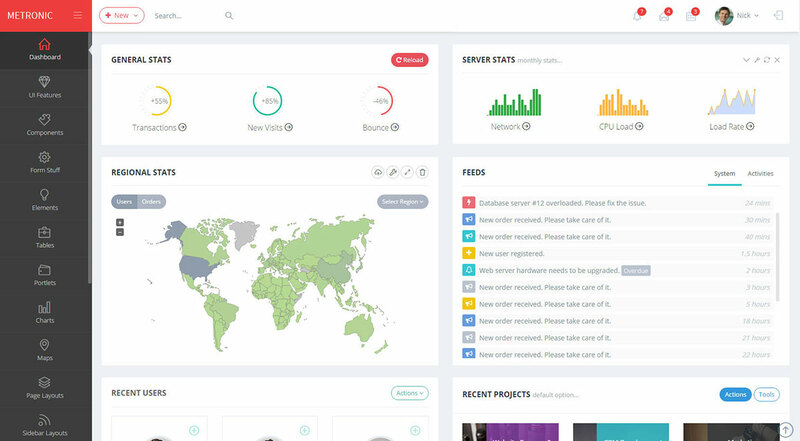 Our focus is mainly on the development of Dashboards or Administration Panels, therefore we are committed to provide the best possible solution for Dashboards and Administration Panels for every Web Application. Web Applications are smart and responsive websites that integrates a backend framework to easily manage their website content. Web applications could range a Content Management System (CMS) like WordPress or an eCommerce framework that allows product management and payment gateways. 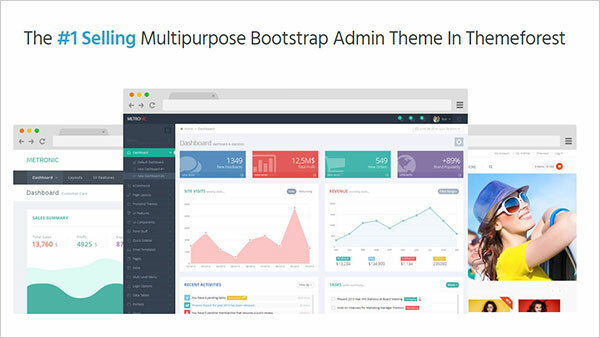 However, some frameworks like WordPress, Magento or Drupal, either do not have a backend dashboard or does not have a responsive or optimized dashboard. This is a common issue that will definitely reduce the web administrator’s productivity and efficiency. This is even more common when projects were created with their own custom backend framework based on tailor-made requirements for developing their Web Application. Developing a web application can take from 6 weeks to 6 months or more depending on the complexity of the framework and with today’s ever-growing time sensitive business markets, projects like this are usually not given enough time to developers to fully flesh out their ideas and plans. 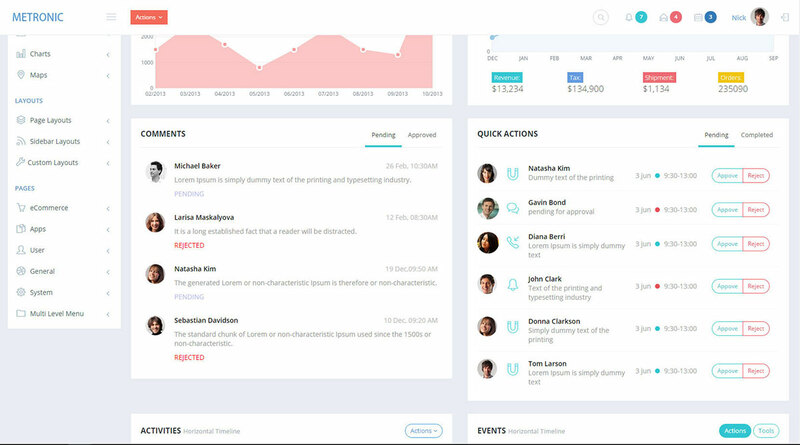 Therefore the first thing that usually gets cut from develop will be the dashboard’s user experience. This is where Metronic comes in. 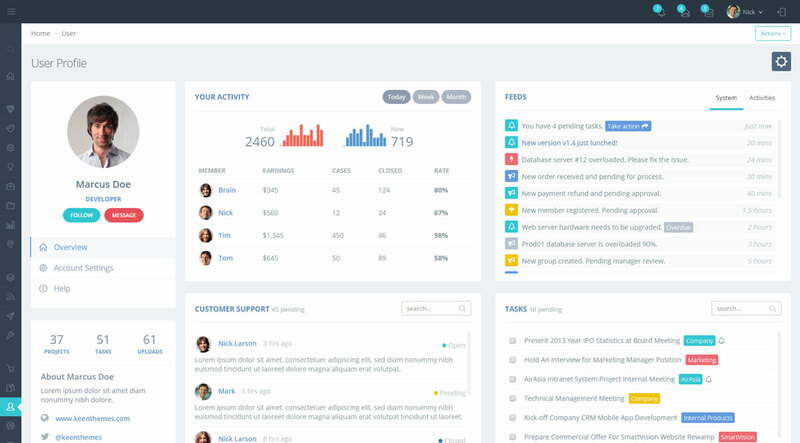 Our commitment with Metronic is to provide everyone access to a fully Responsive Dashboard / Admin Panel with over 1500 different functions and features to cater to any tailor-made framework available. Metronic even utilizes the most up-to-date web standards from Bootstrap, AngularJS, SCSS, HTML5, jQuery, AJAX and even supports RTL (Right-to-Left) reading web applications. 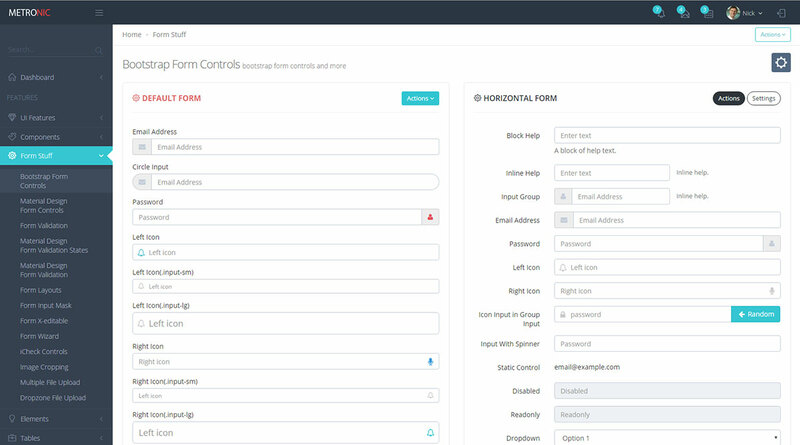 Since Metronic is a HTML5 admin theme, it’s build with easy flexibility and customization in mind in order to allow all developers from any project to easily and simply integrate Metronic into their custom frameworks. We also understand that sometimes the Dashboard will also require some creative touch to clearly identify 1 backend framework from another. 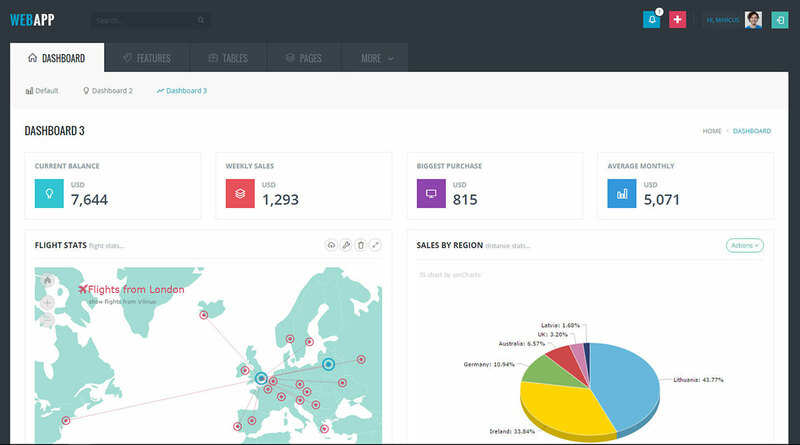 Therefore, Metronic also provides 7 dashboard layouts that can also be easily customized. Each layout comes with a different set of design functions and features. For example, each header is distinctively different from one another. 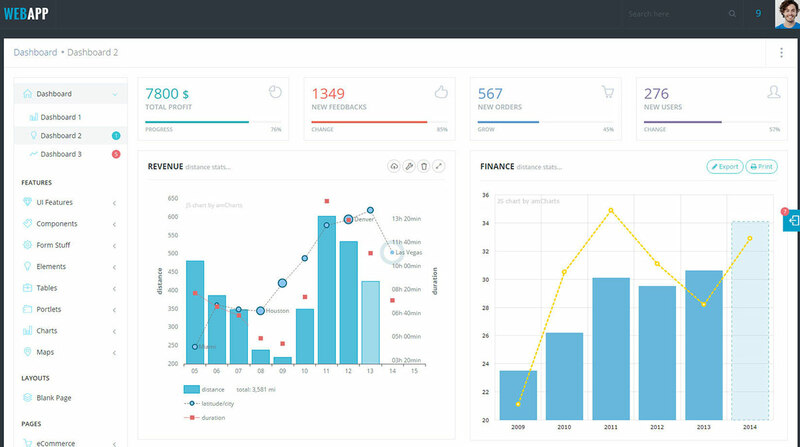 Metronic also allows developers to customize and populate their Dashboards with a huge variety of elements and components. 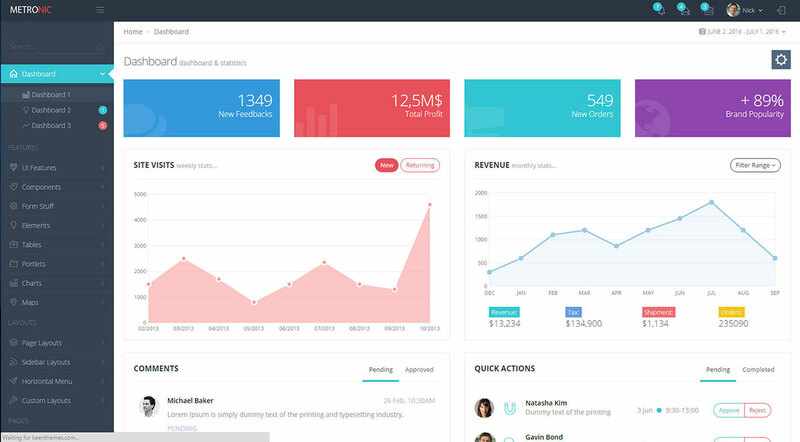 With Metronic, developers are able to focus their work on developing their framework to the best iteration possible along with a high quality responsive and optimized Dashboard with half the time and cost needed. We’ve received many satisfied customers that have informed us that with Metronic, they’ve saved thousands of dollars, weeks of development time for their project and even reduce stress and headaches for their team. It’s feedbacks like this that drives us to innovate Metronic even further and to push the limits of Metronic. We hope to deliver standards with more innovative solutions that we believe that will soon be global web standards in the new future for both the web browsing user and web developers.